Land-locked salmon have been swimming in the waters of Grand Lake Stream since the last ice age. It is home to one of the four native pools of land-locked salmon in the United States. There is no such thing as the perfect cast. There are only casts that catch fish and casts that do not. Riffle: A riffle is a rocky, shallow area in a stream where water cascading over rocks creates a noticeable surface disturbance. To identify a riffle, look for a choppy surface or whitewater spilling over shallow rocks into deeper water. A good riffle will fulfill all of the basic needs of a trout. 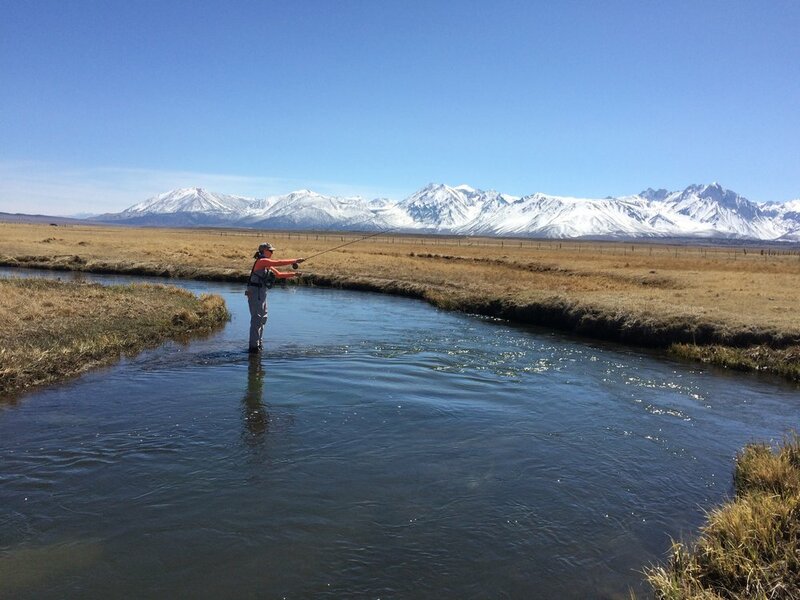 The shallow, highly oxygenated water is a perfect environment for the aquatic insects trout eat. Boulders and rocks create plentiful hiding and resting spots. Deeper water downstream gives trout rest and security. All of these aspects make a riffle a great starting point when looking for trout. It's 120 miles from Popham Beach to Moosehead Lake as the crow flies. The Kennebec River, however, is not a crow. Nor is it all "long quiet waters" as the translation of its Abenaki name or as its placid appearance from Augusta oceanward would have us believe. As Maine was settled by Europeans, nine dams and miles of rapids and riffles were created between Moosehead Lake and Augusta. The East Outlet, the first three-mile stretch of water after the dam at the river's source, is managed for fly fishing year round and offers some of the best landlocked salmon and brook trout fishing in the state. When we fished there in November we were sure to wear our blaze orange. Streams running, air crisping, lines looping. Leaves starting to change, light more direct. A fisherman selects from his fly box and I from my palette. By rod and by brush, we both make a cast to see what’s below the surface.